Weston Church is Kids Friendly! At Weston, we believe that children are a treasured part of our Church Family, and love to include our young people as much as possible at our worship services. BLAST – Bible Learning & Sharing Together. Ages 6 to 9. Our children also lead our congregation in worship once a term, with each child being given the opportunity to share the talents and gifts God has given them. held weekly on Tuesdays 10am during school term. 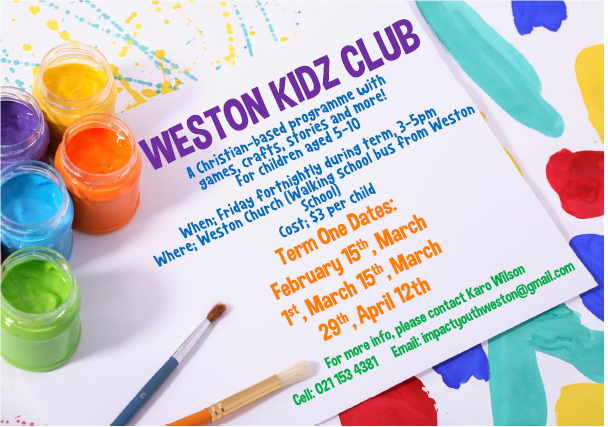 Weston Kids Club happens fortnightly on a Friday at 35pm. There is a walking ‘school bus’ from Weston School. A fun-filled programme for 5 -10 year olds with games, stories, crafts & yummy afternoon tea. See below for this term's dates.